Who doesn’t love Peppa? She is a sweet and caring pink piglet who is constantly surrounded by a menagerie of diverse animal friends and family members who show us a slice of life with humor, empathy and appreciation for the small things. In Peppa Pig and the Career Day, the adult’s in the neighborhood come to school to share about their careers, ranging from everyday workers to artists to specialists, and there is even a sea captain (who everyone needs in their neighborhood!). The wide variety of jobs and careers offer a great outlay of possible aspirations for kids to explore in creative play and then possible what they might become as they grow older. In Peppa Pig and the Silly Sniffles, offers a sneak peak into the funny ways that kids play and how easily they switch between creative play scenarios. Here they enact a scene when one of the friends is sick and has to go to the doctor’s office and they discover, even though they cannot cure the sniffles, they can make their friend feel much better just by being good friends. Both books come with a awesome coloring poster that is hidden on the back of the book jacket. These are lovely hardcover books and will make great gifts this holidays season! I know my granddaughter is going to love them! I highly recommend Peppa Pig: the stories offer great diversity in character and educate about self-esteem, empathy, compassion and acceptance. A wonderful entry into the beauty of all the varied people in this world! They belong in every preschool, home and library! Hooray for Peppa! She’s awesome! Thank you to Candlewick Press for sending me these books. All opinions expressed are my own. For more information about my accessible mindfulness/yoga/dance program, please visit alwaysbedancing dot com. Categories: Always Be Dancing Mindful Movement, blogging, Book Review, children, children's books, Diversity Picture Book, Education, Emotional Intelligence, kids book, Mindful Book Reviews By Eve, Mindfulness, picture books, reviews, social skills | Tags: animals, Book Review, books, career, careers, children's books, compassion, diversity, doctor, empathy, freinds, friendship, jobs, kids book, picture book, school, sel, self esteem, sniffles | Permalink. Categories: Always Be Dancing, Always Be Dancing Mindful Movement, Book Review, children, children's books, Diversity Picture Book, Education, Emotional Intelligence, in school yoga, meditation, Mindful Book Reviews By Eve, Mindfulness, ole namaste, picture books, reviews, social skills, Therapeutic, Trauma, Writing, youth | Tags: 4 abodes, book reviews, books, caring, children, compassion, Emotional Intelligence, empathy, friendship, kids, learn, reviews, sel, social emotional, social skills, teach, teaching | Permalink. Mindfully Me Book One: It’s Always There A children’s meditation book for mindfulness, calm and happiness by Louise Shanagher and Rose Finerty is truly one of the best children’s mindfulness books that I have come across. The book is full of thoughts that pique the interest and understanding the art of mindfulness is easily accessible for children and is written into lovely, flowing rhyming sequences. The artwork is adorable. I love the textured painting juxtaposed onto photographic backgrounds and sprinkled with computer-generated flowers. It’s completely endearing! I am excited to be able to offer a free copy of this book. Please head over to my Instagram page: https://www.instagram.com/mindful_boo… for the giveaway; shipping only available in the continental US. Giveaway Ends 12/10/18. Mindfully Me Book Two: Where Is Happy? by Louise Shanagher and Rose Finerty. The Dynamic Duo Lou Lou Rose is back at it again. 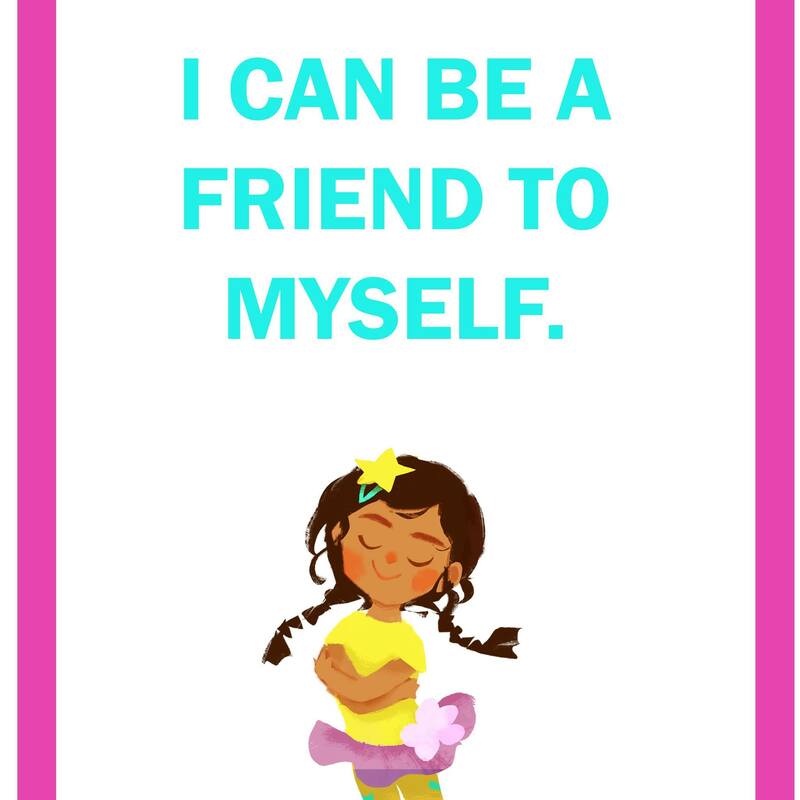 They have created a second book and once again have come up with a beautiful children’s mindfulness book, both through its words and its illustrations, that promotes self-compassion, self-confidence and self-esteem in a perfectly suited for children way. Where Is Happy? encourages children to seek inner peace rather than material gain through easily relatable content written into relaxing, flowing rhyming sequences. The book is full of extra content to help teachers and parents integrate the book and its message. This book is a great read and a great social-emotional learning tool for kids! Mindfully Me Book 3: Look Who’s Here by Louise Shanagher and Rose Finerty. Book 3 of the Mindfully Me Series is another winning title from the creative minds of Lou Lou Rose. Look Who’s Here does a great job of universalizing feelings and emotions by reinforcing the message that everyone has them and if you can take a moment to just notice them in yourself that you will be ok because self knowledge is the key to inner peace. I loved the diverse names used in the book’s lilting rhymes, making for whole lot of fun word play. This book is full of positive ways to notice and address big feelings in an engaging and identifiable way. This series would make a perfect gift for the holidays and every day. I really enjoyed all of the books and know I will use them in my kids yoga & mindfulness classes. They are very well crafted mindfulness books for kids. They are sweet, educational and totally relatable. I especially like the language used and appreciate that it is not syrupy or cutesy, but sincere words that kids will enjoy reading and will be able to ingest. I highly recommend the whole series! Thank you to Lou Lou Rose for sending me this book series. All opinions expressed are my own. For more information about my accessible mindfulness/yoga/dance program, please visit alwaysbedancing.com. Categories: Always Be Dancing, Always Be Dancing Mindful Movement, Book Review, children, Diversity Picture Book, Education, Emotional Intelligence, Mindful Book Reviews By Eve, Mindfulness, picture books, reviews, social skills | Tags: blog, book, Book Review, book reviewer, children, education, emotions, feelings, kids, Mindfulness, picture book, reviews, sel, self esteem, stress reduction, thanks | Permalink. I love how mindfulness in schools is becoming the norm and that more and more teachers and school districts are interested in bringing mindfulness and self-help strategies into their school communities. In my opinion, the younger we can start this the better, as empowering our young children with strategies to deal with big emotions, can only be a win-win for the children themselves and the greater community at large. Lori Lite is in the top of the tier of people offering easily accessible ways to bring mindfulness into the classroom. Her most recent book Stay Cool at School is an adorable and extremely important book for teachers of young children (ages 3-9) who want to help their students identify big emotions and offer them tools to cope. Since coping is a practice, the more this is encourages, the more likely the students will be able to access their wisdom at times of high emotions. In the story, the two adorable dream monkeys, Jumpy & Sunny help the young child in the story to identify the big emotions experienced, from anger to over-excitement to embarrassment and joy. In each instance, they offer up various breathing strategies that anyone can do, without anyone else even noticing, to increase a sense of calm, self-control and to encourage a positive outlook. The illustrations are very cute and I love the fun color palette. The scenarios and emotions are well articulated and this book can be enjoyed over and over again. I highly recommend this book to families and school communities alike. Libraries should have a section for mindfulness books specifically aimed at children. I know I am going to embrace this book and share it with the children I have the opportunity to work with through my children’s yoga program. Its fun and engaging nature make it an easy fit as a gateway into mindfulness for young children. For more information about Always Be Dancing: Yoga & Flamenco for Every/Body, my mindfulness/yoga/dance program, please visit: alwaysbedancing(dot)wordpress(dot)com. Thank you to Lori Lite for sending me a copy of this book. All opinions stated are my own. Categories: Always Be Dancing Mindful Movement, blogging, Book Review, children's books, Education, Emotional Intelligence, kids book, Mindful Book Reviews By Eve, Mindfulness, picture books | Tags: anger management, book, children, childrens book, community, emotions, feeling, feelings, in school, juvenile literature, kids book, libraries, library, picture book, reading, review, reviews, school, sel, self control, self help, tips, young reader | Permalink. This book is fabulous. It is an eye-opening approach to engaging children who suffer from developmental trauma through art activities but can be applied to the general population of children, as I believe that any gateway you can find that allows a child to express and release is a sure fire win! The book is stuffed full of applied practices that are easily adapted to classroom work, yoga/mindfulness programming and for anyone who works with children who wants to engage them outside the box. This book is so creative and well thought out and its myriad of applied practices provide a solid foundation for understanding, assessing, and helping children cope with developmental trauma. I am a yoga and mindfulness teacher and the ease at which I can locate and adapt the tools in this book make it 100% accessible for the as well as mental health practitioners, as the book is full of the most up-to-date clinical information too. This book is a must have for everyone who works with children, not just those who are traumatized, as we can reach out with creativity and compassion to all children to help them release what is hidden inside so they can move forward and thrive. I highly recommend this book. It’s sitting right on my work table along with Dr. Treisman’s Therapeutic Treasure Deck of Sentence Completion and Feelings (please check out my review). This is a dynamic duo of highly accessible, especially for the non-professional, creative, socio-emotional learning techniques and activities for children. They have become indispensable to me. Thank you to Jessica Kingsley Publishing for sending me a copy of this book. All opinions expressed are my own. Categories: Always Be Dancing Mindful Movement, blogging, Book Review, Therapeutic, Trauma | Tags: Accessible, activities, Art, assessment, books, cards, children, copingskills, deck of cards, developmental trauma, how to, sel, self help, Therapeutic, Trauma | Permalink. Listening To My Body by Gabi Garcia is a really nice, effective book to aid children in understanding about sensations and feelings and how these things interact to better help them navigate understanding their own needs. The book is written with compassion and obvious desire to help kids tune in and trust themselves. There are great short noticing activities throughout and I really like the recap word list at the end for a visual reminder of the sensations and feelings brought up by the story. The noticing activities are also listed for easy access. A special shout out to Ying Hui Tan for her adorable illustrations. The characters are sweet and they clearly express the content of the book. The art is textural and creative and very endearing. 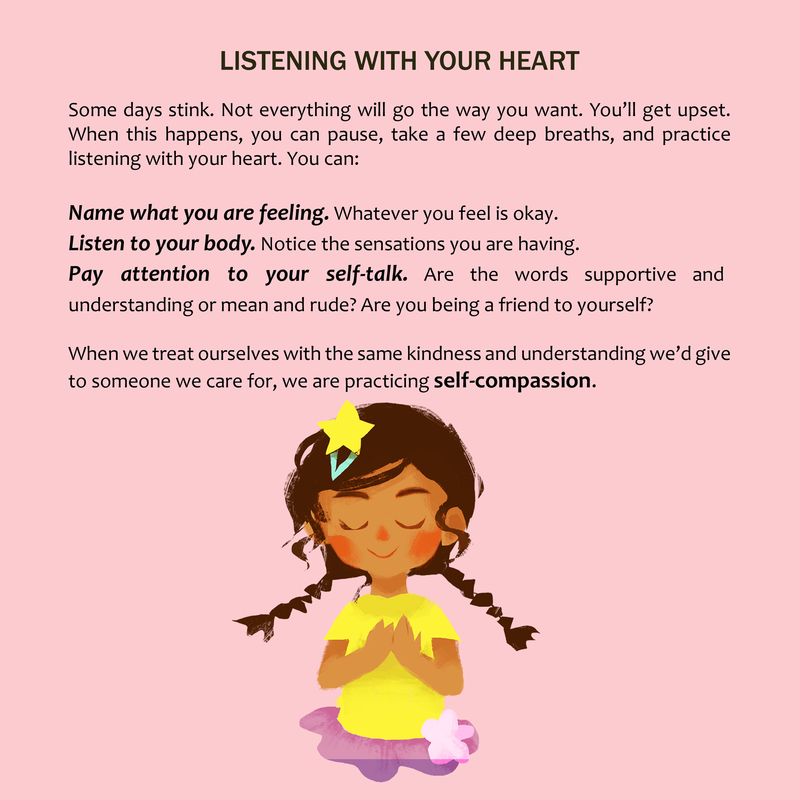 Listening With My Heart: A Story Of Kindness And Self-Compassion by Gabi Garcia shares the messages of awareness, self -respect and friendliness, using positive self talk within a story that empowers you to being true to yourself. The spirit of the book is openhearted and generous and the illustrations are super adorable. The message is clear-be compassionate and kind to yourself so that you can reach past yourself and extend the kindness to others. The illustrator, Ying Hui Tan, has really developed her style and palette. The children’s wide-eyed expressive faces display great emotion and work in beautiful unison with the words. I love the layering effects and the wide use of texture. The back of the book has some wonderful kindness activities. All around, this is simply a lovely book! I highly recommend these books. They make great read aloud’s to share with children, students, parents and teachers. These books should be in libraries, classrooms and homes! Full Disclosure: The author sent me these books. All opinions expressed are my own. Categories: Always Be Dancing Mindful Movement, blogging, Book Review, Education, Emotional Intelligence, meditation, Mindfulness, social skills | Tags: Always Be Dancing, books, children, childrens book, fitness, Framingham, health, healthy, kids, Massachusetts, mental health, MetroWest, metrowest kids, Natick, picture book, reading, sel, youth | Permalink. Book Reviews by Eve: Two books from Lee & Low that promote mindfulness, building self-esteem and diversity are Rent Party Jazz by William Miller & The Happiest Tree, a Yoga Story by Uma Krishnaswami. Rent Party Jazz by William Miller is a story, above all, about struggle, responsibility, hope and community. The great brush-stroke illustrations by Charlotte Riley-Webb create movement giving life to the scenes of New Orleans, to the people and to the trains of music pulsing through the city. You can practically feel the music bringing them all together, giving the reader a sense of belonging in the story too. I really appreciate the beautiful color palette and how the party scenes are so lively and colorful, contrasting against the darker, more somber tones of the street. This story is both culturally significant and historically accurate. Rent parties are used to raise money, are a way for budding musicians to get off the ground and a selfless way to hold space for those in need. I highly recommend this book-it might inspire a blossoming philanthropist or a child with a heart of jazz. The Happiest Tree, a Yoga Story by Uma Krishnaswami is a story that encourages interest, bolsters determination and increases self-reflection. Through yoga, it shows how it is empowering and uplifting to challenge oneself. The main character, Meena, starts off with a weak sense of self and fearing rejection, but through acts of self-challenge, she emerges with inner strength and a strong self-esteem. The sweet illustrations by Ruth Jeyaveeran, show great expressions of interest, happiness, doubt and support that really highlight the emotional content of the story. I love the peppering of authentic Indian phrases throughout the story, making it culturally relevant and inviting. I highly recommend this endearing story of self-realization and inner peace. Thank you to Lee & Low for sending me copies of these books. All opinions are my own. Categories: Always Be Dancing Mindful Movement, Book Review, children, childrens yoga, classroom yoga, Emotional Intelligence, kids yoga, Mindfulness, social skills, yoga, yoga for kids, youth yoga | Tags: book, books, children, friendship, kids, reviews, sel, story | Permalink.